Mt. Rainier is more than a mountain, it's also the closest national park to Seattle. 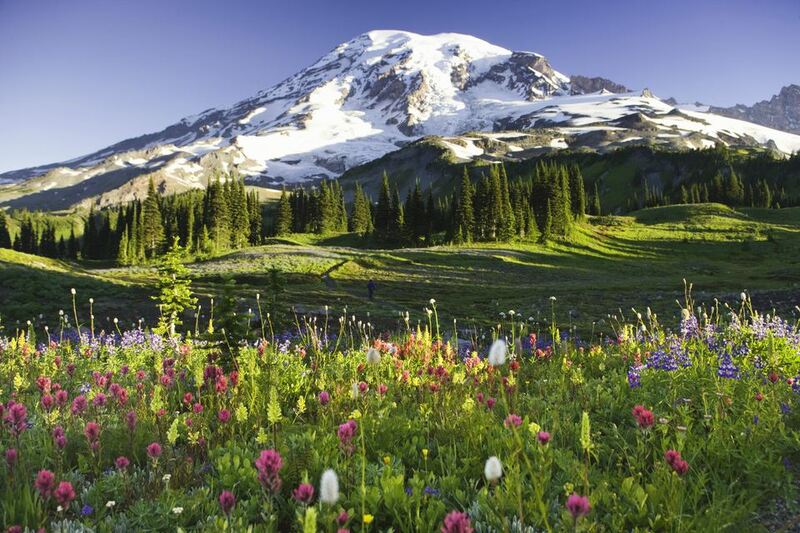 At 14,410 feet Mount Rainer National Park beckons mountain climbers from May to October, but it's also a popular day destination for hikers, campers, photographers as well as people who simply want to take a scenic drive and see the waterfalls and wildflowers. Most hikes offer breathtaking views of lakes, landscapes, and floral fields, and you'll be able to find a hike to do whether you prefer steep inclines or level ground. Some of the most popular places to get out and enjoy the mountain scenery on foot are the two highest points you can get to by car—Sunrise and Paradise, where you'll find wildflowers in the spring, stunning color in the fall plus a visitors center and a restaurant and lodge at Paradise. Entrance fees are charged when you drive into the park, but there are also free days throughout the year (expect crowds if you go then). Mt. St. Helens is most known for its momentous eruption in 1980, the biggest volcanic eruption the entire United States had seen in recorded history. Visits to the mountain today still show signs of the eruption—trees burned by the heat, changed lakes and geography, and the fact that this mountain lost more than 1,000 feet of its former height. Today, what visitors, hikers or climbers will see is a mountain topped by a crater. As you approach the mountain, you'll be able to stop at a number of visitor centers and viewpoints, but don't miss the Johnston Ridge Observatory where you can see the mountain fairly up close as well as view a movie about the eruption. Olympic National Park is located a short ferry ride from Seattle across the Puget Sound to Bainbridge Island. You can also drive south on I-5 and take I-16 out of Tacoma or U.S. Highway 101 out of Olympia west to the peninsula. This national park is popular with hikers, backpackers, and campers for a reason—the park is huge. With more than 1 million acres to explore that range from forests filled with ferns to beaches, to the Olympic Mountains. While the national park includes seashores and rain forests alike, don't miss some time exploring the Olympics. The tallest peak is Mt. Olympus at 7,980 feet, but even non-climbers can drive up to Hurricane Ridge and catch some breathtaking views. Second only to Mt. Rainier in height, Mt. Adams is 12,281 feet high and looks a bit like Mt. Rainier to the untrained eye. Like Mt. Rainier, it's located in the Cascades Range but is located 50 miles farther south near the Washington/Oregon border. Like most of the other mountains in Washington State, you can climb Mt. Adams, but it's also fine for hiking, camping, and outdoor recreation, although, more remote than Mt. Rainier. The plus side of this is that it is less crowded. Mount Pilchuck is a popular hiking destination for everyone from intermediate to experienced hikers. You may have also heard this mountain's name in association with local glass artist, Dale Chihuly, who founded a glassblowing school in the area. Climbing Mt. Pilchuck involves a steep three-mile hike up through loose rock and scree to the fire lookout at the top. It's usually very crowded in the summer so plan accordingly and give yourself some extra time. Also plan accordingly as there is usually still snow on the trail through midsummer, so check conditions before you bust out your hiking sandals. On a clear day, you'll see a panoramic view of the Cascades, Olympics and the Puget Sound from the top. You will need a ​​Northwest Forest Pass to park. Mt. Baker in Bellingham is very popular with skiers and snowboarders in the winter and hikers in the summer and fall. It's also the start of the annual Ski-to-Sea race, a seven-leg adventure race involving teams from recreational to competitive. You don't even have to hike Mt. Baker to enjoy amazing views, though. Catch a ferry boat headed to the San Juan Islands, and you'll find the perfect way to enjoy views of the mountain. The Big Four Mountain and Ice Caves in the Mt. Baker-Snoqualmie National Forest are off the Mountain Loop Highway outside the town of Verlot (where you must pick up a trailhead parking pass at the Verlot Public Service Center). The ice caves are a nice short hike with the help of the aluminum bridge that gets you across the river. Caution must be taken and it is important to stay on the designated trail. This area is part of an ever-changing environment, with winter and spring avalanches and rock and ice falls. Diablo Lake is a reservoir situated in the Washington Cascades, one of the major mountain ranges in the state. It's not a mountain itself, but this is a perfect place to enjoy some recreational pursuits and take in a view of the mountain range. There's a great viewpoint located right off Highway 20 in the Ross Lake National Recreation Area. It's a popular recreational area with campers, hikers, and boaters. Note: Highway 20 is closed usually November to April during snow season.